This week we start a brilliant and in-depth blog from Andean Trails’ travellers Jane and Greg Windsor, who spent four fantastic weeks in glorious Ecuador. “Our approach into the new Quito airport was from the south, flying along the ‘Avenue of Volcanoes’. It was like being in a tunnel where we could reach out and touch the mountains either side. The old town is built below an extinct volcano, Pichincha, which has many ridges radiating out from it. Every so often the Andean mountains reveal themselves high and imposing, towering over the extended city as if they rule the roost, which of course they do. Quito is a city of numerous beautiful and ornate churches. A resident told us that there are 180 churches in the old town. El Panecillo (translated as ‘small piece of bread’ in Spanish) is a 200m high volcanic hill on the south side of the old town. In 1976, the Spanish artist Agustín de la Herrán Matorras was commissioned to build a 45m tall monument of a ‘classic’ madonna who stands on a globe and steps on a snake. The virgin is assembled on a high pedestal on the top of Panecillo and can be seen from any location in the city. Our taxi driver, Wilson, took us to a rooftop, glass windowed restaurant where we had fantastic views of the city, its churches, its imposing statue and its twinkling fairy lights. Dining with this outlook would have been fabulous but there was a disadvantage to the restaurant which the locals were prepared for but we weren’t. It was so cold at dinner that everyone wore coats and hats throughout the meal. The waiters were over-attentive to the extent that we were almost chasing our plates as they removed them from the table before we had finished. In an attempt to warm up after dinner, we ordered hot chocolate. What looked like a generous serving of marshmallows in the hot drink was actually lumps of melting cheese. It was a local speciality! We had several experiences in Quito which demonstrated to us that we were in a country with a very different culture from ours. From the window of Hostal Fuente de Piedra, our hotel in the city centre, we observed workmen on the rooftop of a nearby building waiting in the rain for a delivery of concrete, all dressed in yellow ponchos, over-trousers and rubber boots. On a walk back from visiting some of the historic buildings, we witnessed four Chagras (Ecuadorian cowboys) riding through the middle of the city on horseback. At the weekend, the old city had a festival-like party atmosphere and the cobbled streets were full of people, music, stalls with many types of merchandise and mysterious looking food and, of all things, a breakdancing competition. Sunday is cyclists’ day with some main roads in the innermost part of the city being closed off to motorists. Bicycles are available for rent and being used everywhere. There is a laid back feel to the day with all non-motorised modes of transport taking over the streets, the paths and the parks. It seems that the whole world is outside enjoying a bit of rest and relaxation. Quito sits at about 2,900m above sea level and this altitude brings with it steep hills and valleys in every direction. Navigating one’s way around the city means always travelling up or down, around hillsides with precarious hairpin bends, along winding cobbled roads, crossing bridges with deep ravines and raging rivers. It takes a long time to travel anywhere and this cannot be underestimated. Traffic congestion is unbelievable. There are so many vehicles in the city that only cars with certain registrations are permitted to enter the city each day. This was introduced to encourage people to use public transport and car share but unfortunately the public transport infrastructure is not robust enough. This has meant that, as one taxi driver told us, richer people have bought a second car instead. This traffic system is heavily policed with on the spot fines. A haze hangs over the city preventing a clear view of the spectacular nearby Andes in the otherwise clear mountain air. 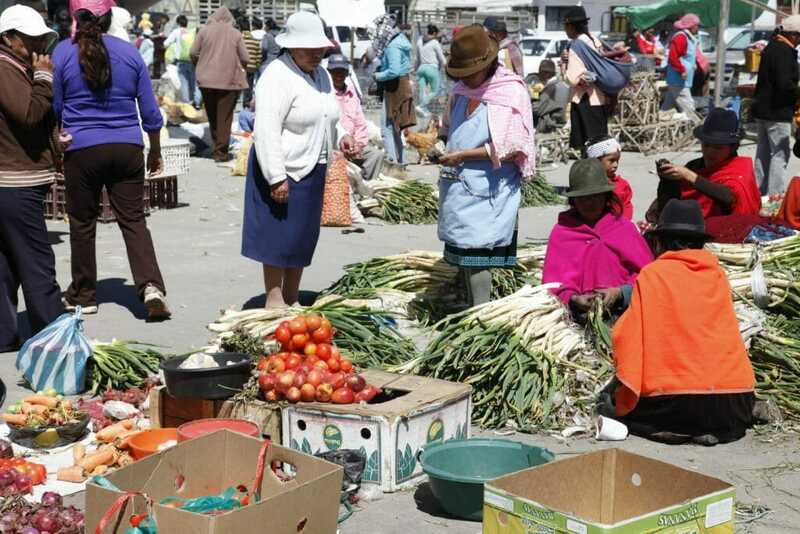 Street vendors patrol at traffic lights and junctions to take advantage of the time people spend stationary in their cars, selling anything from paintings, kitchen appliances and dolls to mobile phone accessories and ice-cream. The volcanic soil is rich, dark and fertile and where it is cultivated, it is laden with fresh and tasty grain, vegetables and fruit. Avocado is in abundance and served at breakfast, lunch and dinner. The Tree Tomato (tamarillo) is an egg-shaped edible fruit which grows on large trees and is one of Ecuador’s favourite fruits due to its versatility. It was served as a savoury starter mixed with garlic and onion and the juice mopped up with bread, as part of a main meal to accompany the meat and vegetables and also as a stewed dessert cooked with brown sugar, the dish tasting similar to cooked apple. Sampling the local soup was obligatory, mainly potato and provided every night as a starter (we were told that there are 380 types of potatoes in Ecuador). Eating the soup in the local style meant that we added some different and strange additions to it such as popcorn, avocado, cheese or aji (spicy chilli sauce). Every place was proud of its own variation on homemade aji and this was used as an accompaniment to any part of a meal except dessert. The rose industry forms a significant part of Ecuador’s export. In peak season, ten Boeing 747 Jumbo jets depart daily, laden with tall, elegant although strangely odourless roses, bound for North America and Europe. As we approached the airport, the extent of the industry became evident as there is a separate truck lane signposted ‘Flowers’ which leads to a dedicated freight terminal. We’ll be serialising more from Jane and Greg in the coming weeks, from Galapagos Islands to Amazon to horse riding. THANK YOU for helping us to organise such an amazing holiday. Tom and all of you who were involved got it just right! It was all we’d hoped and more. Having it all organised in advance was a real luxury and every aspect of your advice and recommendations and the quality of the guides, venues, adventures and activities were superb.